AN-LAN-EXT-ENH-200-POE-4 PoE Ethernet Extender is a high-speed Ethernet transmission device. It can transmit Ethernet and Power signals together for PoE devices. It transmits data network signal up to 1,000m over any pair of 2-wire such as Cat5, coaxial cable, telephone line and power line, etc. The max physical bandwidth can reach 200Mbps. It supports PoC and PoE functions. Network & Power can be transmitted over two-wire. But it is worth to point out that the output power consumption of PSE must the requirements of PD. On a certain distance, this device can support one PoE module network to supply power for multiple PD. But you must consider the power redundancy. Power loss and attenuation differs from the cable types. The following PoE power supply testing tables are just for your reference. Tips: In the above figure, the left vertical coordinate is PoE power output, the below horizontal coordinate is PoE transmission distance, please simultaneously contrast the horizontal and vertical coordinate to get accurate corresponding power output. If you do not know the cable specific specifications of the transmission of PoE power, you can refer to figure (2) the right of the resistance to test in advance. And you can test the total resistance of single cable and accordingly check cable power attenuation coefficient. Now the PoE power supply requirements of network equipments is 48 ~ 56VDC. Long distance power transmission will cause certain attenuation. Please choose power supply module, the voltage is more than 48V. The above is the loss attenuation table of power transmission. If you only transmit network data signal over cables, you can figure (1) network bandwidth attenuation table. 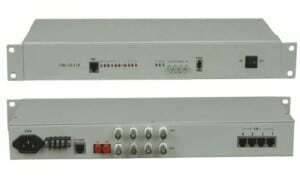 This device is suitable for multi- PoE devices powered over one cable. But it does not represent that it can supply power for four largest power consumption equipments at the same time. For example, the maximum transmission power of power consumption is 50W, using the RG59 coaxial cables. It can leave about 30W power consumption when the distance reaches 500m. The four port of front side allocate and couple with the loss of the cable. Each port can only connect the PD < 7W. Short Distance (RG59 200m): Use PoE switches or PoE power supply module to offer power for the local side. PoE power can be transmitted to the remote side over cable. And AN-LAN-EXT-ENH-200-POE-4/PD can offer PoE power output for remote side equipment. Long Distance (RG59 500m): Use external 56VDC power adaptor to offer power for the local side. PoE power can be transmitted to the remote side over cable. And AN-LAN-EXT-ENH-200-POE-4/PD can offer PoE power output for remote side equipments. Tips: The power consumption of each port support IEEE802.3af/at standard. However, due to the difference of line loss and transmission distance, it may not be able to meet simultaneously four PoE PTZ cameras power supply with high power of IEEE802.3at standard. When you use AN-LAN-EXT-ENH-200-POE-4, please follow the below tips as a reference, in order to reduce the fault in the process of using and the inspection work. This device suggests using 2-wire or coaxial cable to transmit data, if need to transmit PoE, please use higher specifications cable, suggest using RG59 or RVS 2×0.75mm²or above. Different kinds of cables mix connection may reduce the quality of signal. The device supports PoE, DC Power Input and the remote device PoE Power Output. Make sure the electrode of transmission cable is consistent, otherwise, it is easy to cause the power failure. Please cut off power supply before using the device. Supply power after checking all connection is right. Unplug or plug devices are strictly prohibited when devices are working. The 4-port slave unit doesn’t need external power supply, the back-end master unit need to supply power, the total power consumption of master and slave unit is 8W. If use external power adapter to supply power, suggest using power adapter (48～56VDC/1A) for master unit. Suggest using power adapter is less than 60W to supply power for the device, don’t suggest to connect PoE Input and DC power adapter simultaneously in case of damaging devices. The power adapter consumption should exceed more than 30% of all equipments, to ensure the normal power supply output under the cable loss. If you use PoE switches or PoE module power supply, please choose the output power exceeds more than 30% of all front-end equipments. AN-LAN-EXT-ENH-200-POE-4/PD power output should be adjusted on base of PD equipments power output capacity. For example, it can be changed to 3-channel PoE output & 1-channel common network. Master and Slave unit can’t be installed oppositely. Master unit is installed at control room side for easily power supply. When using management PoE Switch and the line connection is correct, but the devices don’t work, please firstly unplug the coaxial cable at master side, separately supply PoE power for master unit, when master unit is working normally, then connect coaxial cable. AN-LAN-EXT-ENH-200-POE-4 PoE Ethernet Extender is a high-speed Ethernet transmission device. It can transmit Ethernet and Power signals together for PoE devices. It transmits data network signal up to 1,000m over any pair of 2-wire such as Cat5, coaxial cable, telephone line and power line, etc. The max physical bandwidth can reach 200Mbps. It supports PoC and PoE functions. It consists of the master unit (AN-LAN-EXT-ENH-200-POE-4/PSE) and slave unit (AN-LAN-EXT-ENH-200-POE-4/PD). By PoE power equipment, it can directly supply power for the remote device, supporting point to point and point to multi-point. It can greatly simplify the project cabling, applied to expand network system and transmit long distances of PoE device signals.